Even worse for Starbucks, it was an unpopular bad idea. Marketwatch reports this week: “The colorful beverage drove approximately an incremental 0.4% of the social-media mentions for the quarter, compared with an incremental 6.5% of social-media mentions for the Unicorn Frappuccino during the third quarter of 2017.” That Unicorn Frappuccino of April 2017 apparently set a pretty high social media bar, one that the Crystal Ball Frappuccino didn’t come close to clearing. Come on, millennials! You’ve got Instagram posts to fulfill! 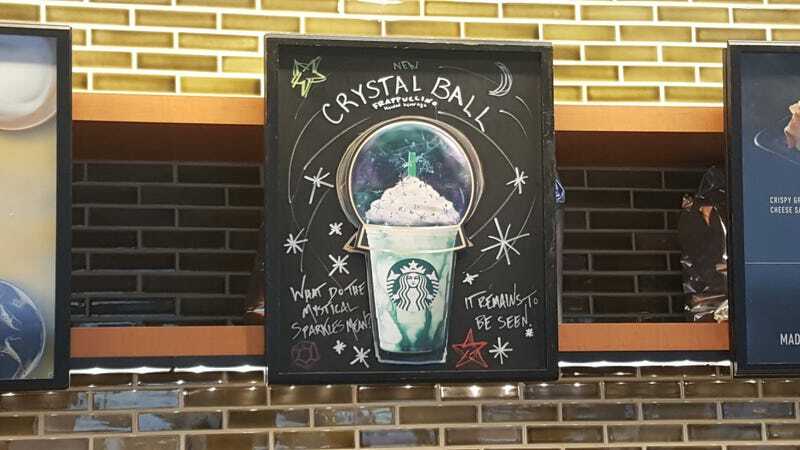 Actually, Ansira marketing exec Kelly Jo Sands told MarketWatch, the earlier drink might have doomed the later one: “Because the Unicorn frap did not taste as great as it looked, consumers may have been hesitant to purchase the Crystal Ball Frappuccino and share their experience on social media.” As it stood, the Unicorn Frappuccino was a social media star, the Crystal Ball not so much. But maybe better Starbucks days are ahead: Barron’s analyst Chris O’Cull agrees that “based on social media analysis, the latest limited-time-only offering is having less of an impact that previous specialty Frappuccinos, despite getting better reviews—especially when compared to past hits like the Unicorn offering.” While the recent crap weather nationwide might have hurt sales, “O’Cull warns that it could be more than this, as these ephemeral Frappuccinos are starting to lose some of their luster. Thus, he’s encouraged that the company has moved to a new strategy to ‘revamp its short-term beverage promotions.’” We are all for fewer high-sugar nightmare-inducing frothy beverages; we’re only at Starbucks for the caffeine. Point/counterpoint: Does Starbucks belong in a national park?